Some days feel like a heavy dark mantle hanging around your shoulders. Depressing thoughts, sadness or pain drain life of all its colour. Sometimes a moody grey sky makes things even worse. Fortunately, most of the time things will brighten up the next day. But sometimes a mood like that may linger, caused by an incurable illness, an evolving depression or a remaining handicap. This is how Kees de Kort draws Bartimaeus (Mark 10:46-52), who one ill-starred day lost his sight, in his illustrated Bible: wrapped up to his neck in a drab black-brown cloak. The ragged loose end of a brown band recalls the swathes of a mummy, just like his white bandana. Bartimaeus has not always been blind. This we may conclude from his answer to Jesus’ question what he would like Jesus to do: ‘Rabbi, let me recover my sight.’ He knows what he is missing and that only aggravates the pain. In those days without braille and voice computers, a blind man had no perspective whatsoever, doomed as he was to spend his life as a beggar, in exchange for lodging in the house of a benign family member. But more gruesome than Bartimaeus' cry for help is the reaction of the people around him. His cry for help arouses irritation instead of sympathy! From all sides people snap at him that he should hold his tongue. How can they be so heartless? 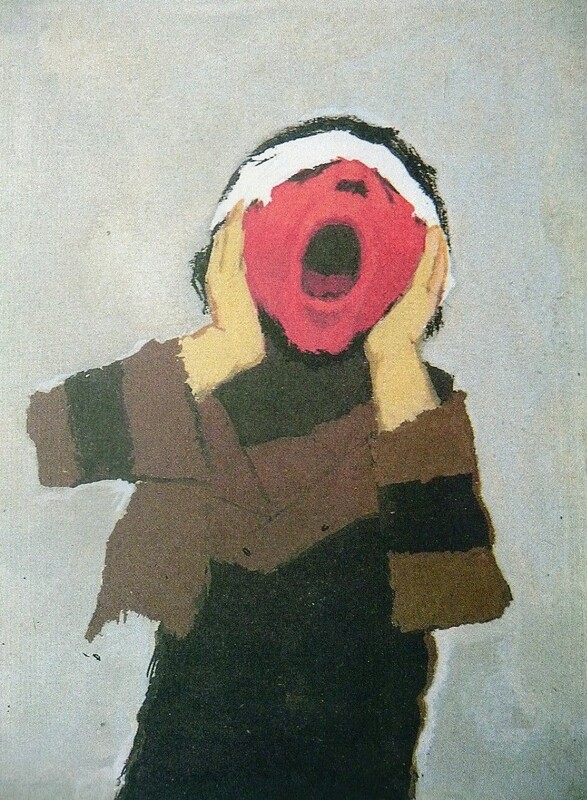 Kees de Kort has depicted the screaming Bartimaeus in a way that reminds one of the incisive painting The Scream by Edvard Munch, his hands covering his ears. Is he protecting himself against the ruthless snarling surrounding him? His mouth is dilated in a cry for help, even louder than at first. His head turns red. 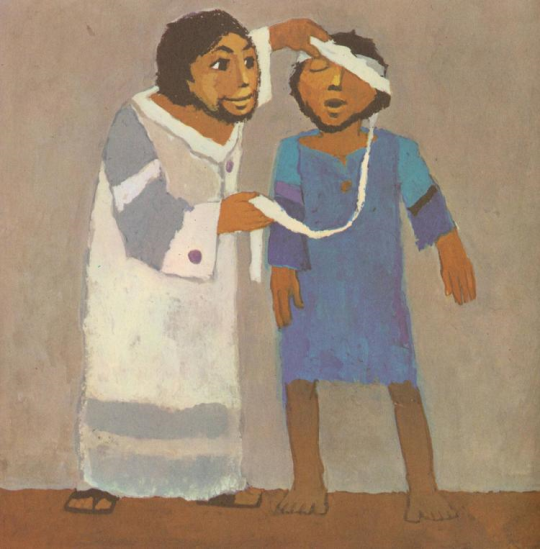 A white bandage is wrapped around his head, covering his eyes, as if the artist means to tell us that this concerns not only this blind man but everyone wounded by life. Bartimaeus throws off his gray cloak, the burden of his existence, jumps to his feet and runs towards Jesus, as if he can already see. And then Kees de Kort shows us what was hidden underneath that cloak: a sky-blue garment (like the garment of Maria, Jesus' mother). In all his blindness Bartimaeus never lost sight of heaven. Sickness and misfortune bring little good, but they can make you wiser. It was Bartimaeus’ blindness that made him experience the true faces of men. And by hearing about Jesus he recognized in him the Messianic king who brings salvation, calling him reverently ‘Son of David, Rabbi.’ Who else should he follow on the path from death to life? Kees de Kort: Bartimaeus, illustrations in the The Big Picture Bible Book, 1992, a hard cover edition with illustrations taken from 28 volumes of Bible stories that first appeared as part of the series ‘What the Bible tells us’, Dutch Bible Society.